At Hybrid, we like to do our research; we will do whatever it takes to ensure that we fully understand a brief. 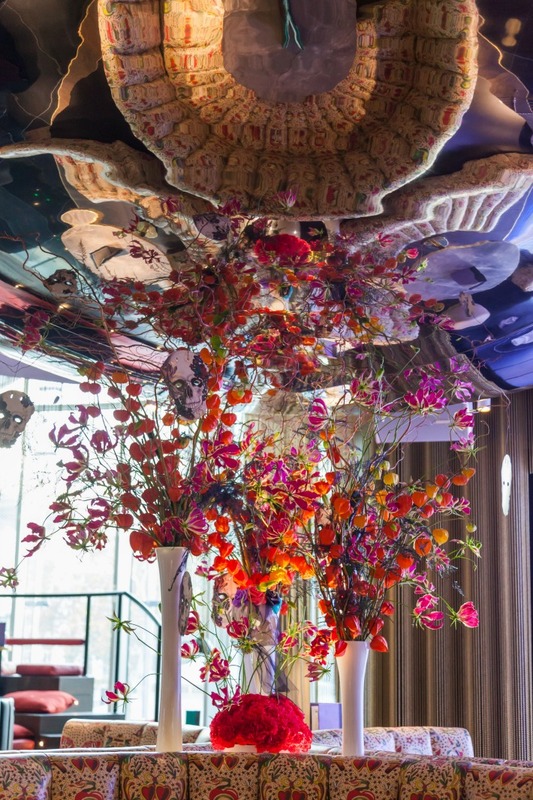 Often this means looking into the historical significance of flowers or working out which floral scents will complement others in a display, but sometimes things can go a bit weird. A bit spooky. A bit, well, otherworldly. And this is a case in point. 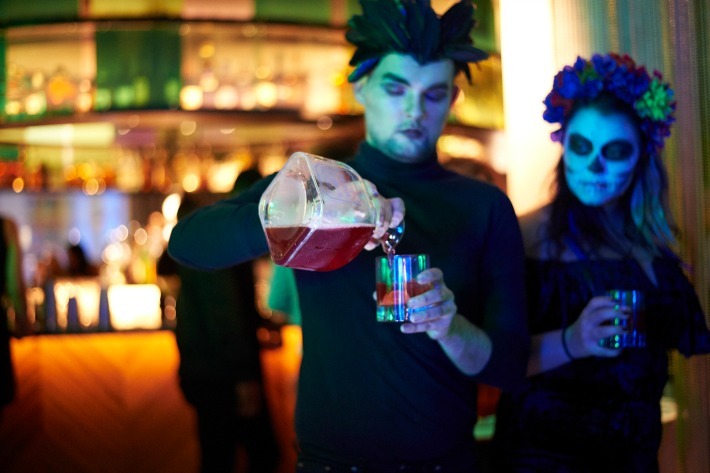 As soon as we were given the terribly exciting brief from our friends at W London for a Mexican themed “Day of the Dead and Decadent” party at The Perception we knew that we were going to have fun with this one. 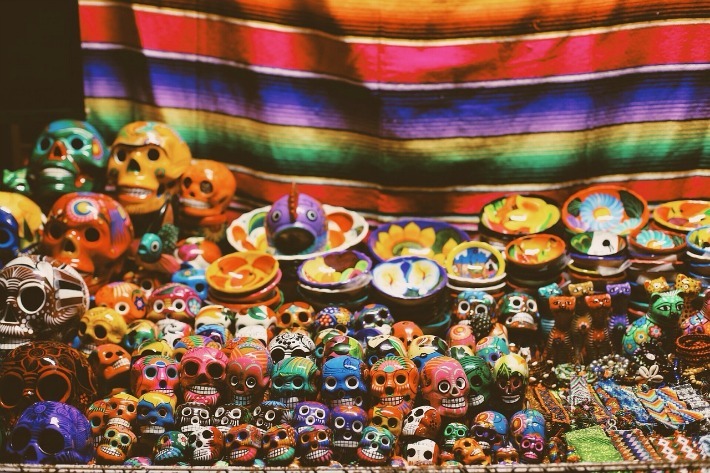 As luck would have it, our lovely Liliana at Hybrid knows a thing or two about the tradition of the Day of the Dead (El Día De Los Muertos) and she whisked us off to lunch at La Bodega Negra, a wonderful Mexican restaurant in Soho, purely for research purposes you understand. 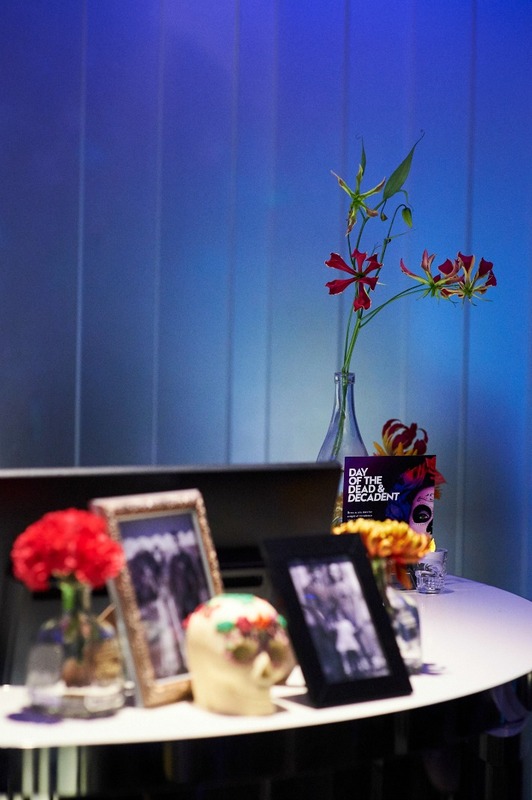 Here we chatted to Liliana and her friend to find out all about the Mexican valued tradition of celebrating and remembering their lost love ones. 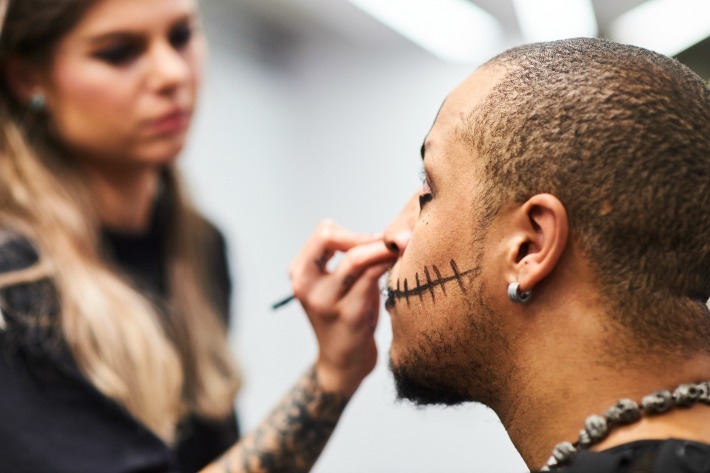 Stop thinking Halloween right now! 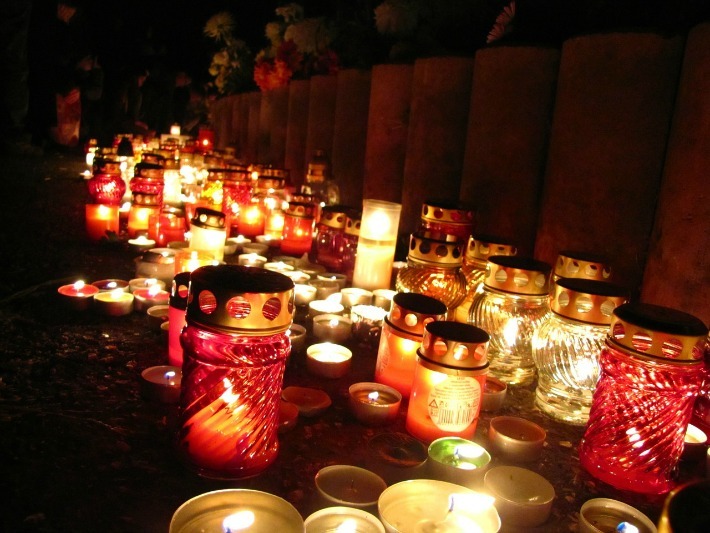 Now, it is important to note that the Day of the Dead is in absolutely no way a scary, ghoul obsessed, ‘Halloween’ type thing; It is more a celebration of life and a demonstration of respect for deceased family members. 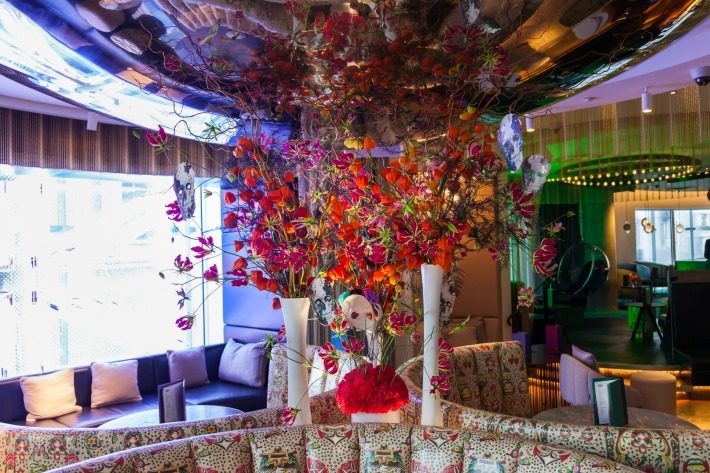 It just so happens that the Mexican way of expressing this is stylish, glamorous and sassy! 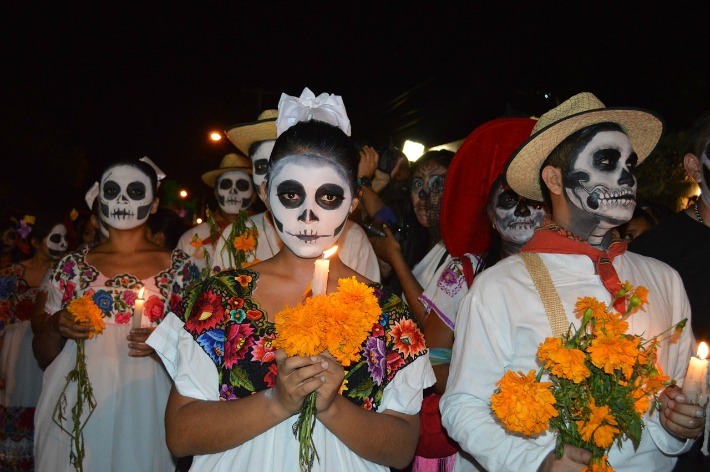 Every year, for a couple of days at the beginning of November, in towns and cities throughout country, Mexicans take part in candlelit parades and processions, throw raucous parties, wear stunning costumes and put on elaborate makeup. They also surround themselves with flowers, in particular the vividly coloured, fluffy petalled marigold, for which which we have a massively soft spot. 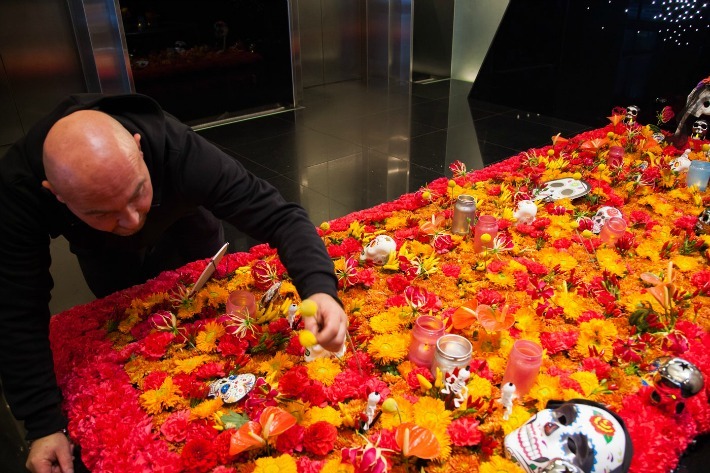 That day sitting at La Bodega, we learnt that beautiful, floral ‘altars’ are created every year to welcome the spirits back to the living in an explosion of colour. In fact, every restaurant in Mexico City will display an altar in celebration of this national holiday. And those beautiful skull decorations that we have all seen? Well they aren’t intended to scare people. “La Calavera Catrina”, aka the Lady of Death, first appeared as the Aztec Goddess Mictecacihuatl, Queen of the Underworld, protecting the bones of the dead and presiding over death at festivals like the modern day El Día De Los Muertos. More recently, José Guadalupe Posada resurrected the image circa 1920 in an etching called “La Calavera Catrina”. The aim here was more satirical: to make fun of the current trend in Mexico to aspire to be like aristocratic Europeans. 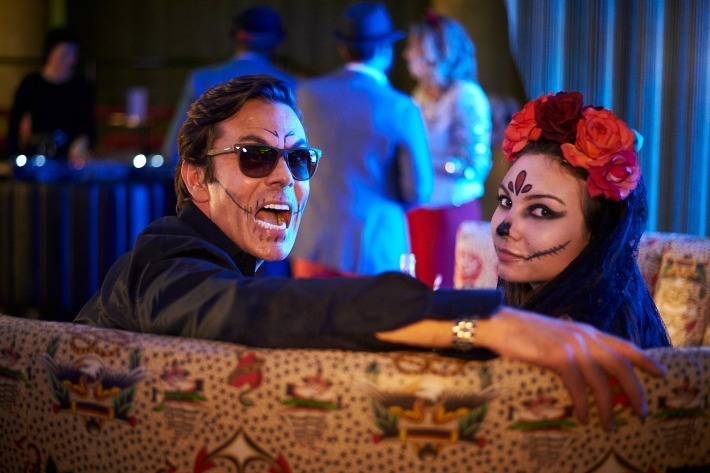 Fast forward to present day and La Calavera Catrina is seen everywhere. Her face appears on all types of goods including food, masks, craft items and, of course, in fashion. 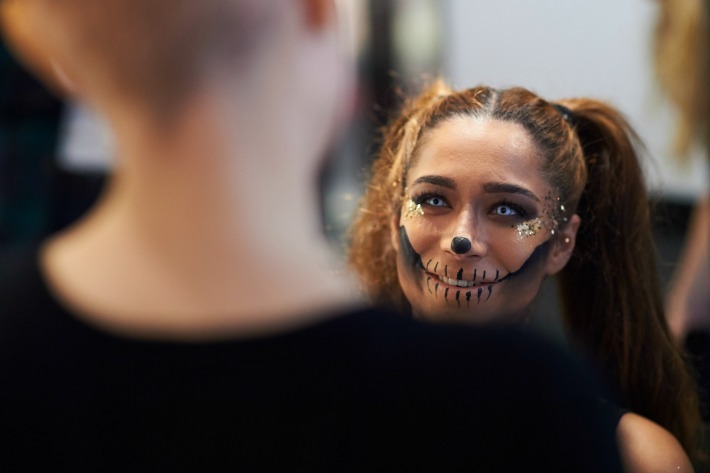 Her face has become synonymous with El Día De Los Muertos. 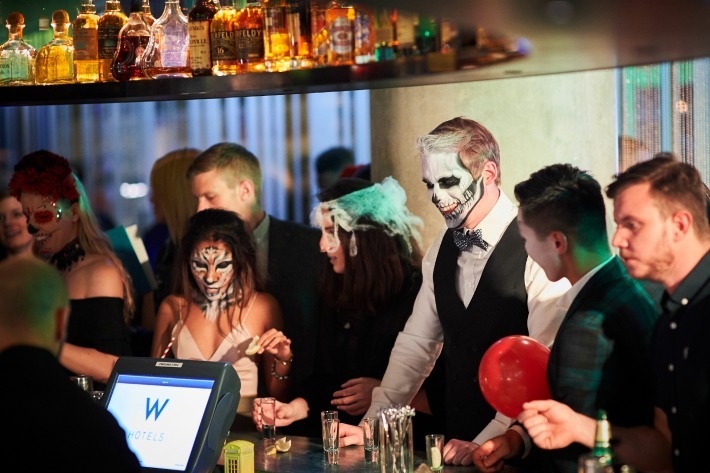 The team at the W London Leicester Square knew exactly what they wanted for their event: a ‘Day of the Dead and Decadent’ party that would ‘see the spirits of Soho take centre stage for two epic nights’. 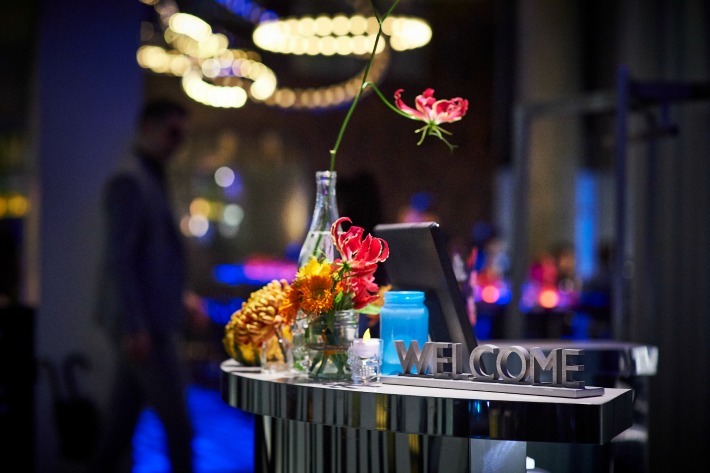 Guests were to embark on a journey starting at the entrance of the unequivocally trendy hotel on Wardour Street. 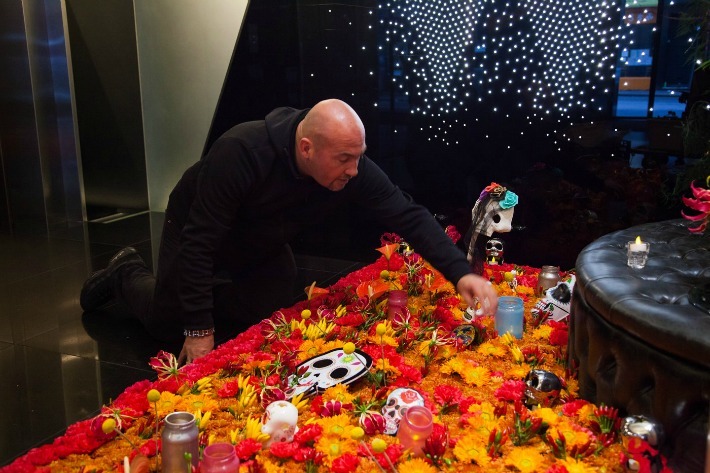 The ground floor of the sleek, black, night-club style lobby was filled with richly coloured flowers, candles and of course, La Calavera Catrina in the form of an altar. 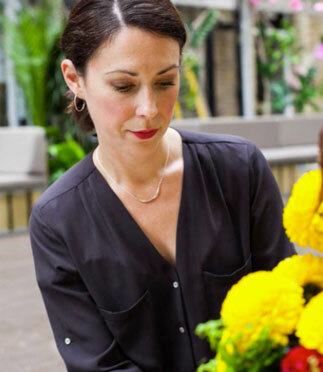 We decided that our beloved marigolds would be the main flower and combined them with amber coloured dahlia, spicy chilis, magenta carnations, anthuriums, glorisoa and craspedia. 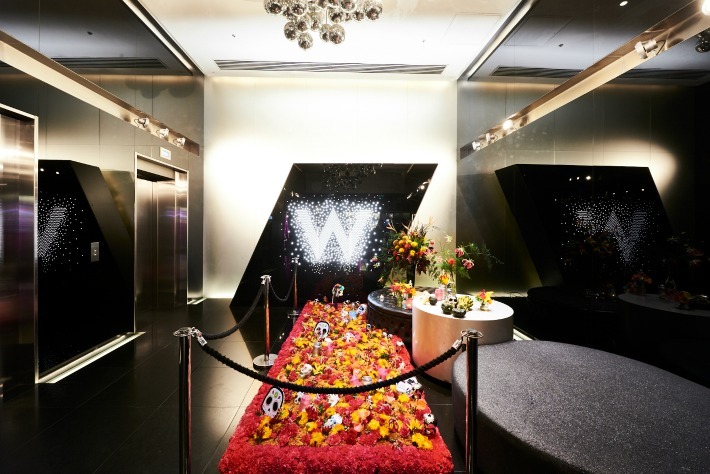 Revellers made their way up to the first floor where the elevator doors opened onto the most exclusive of parties set in one of the most trailblazing hotel interiors in London. 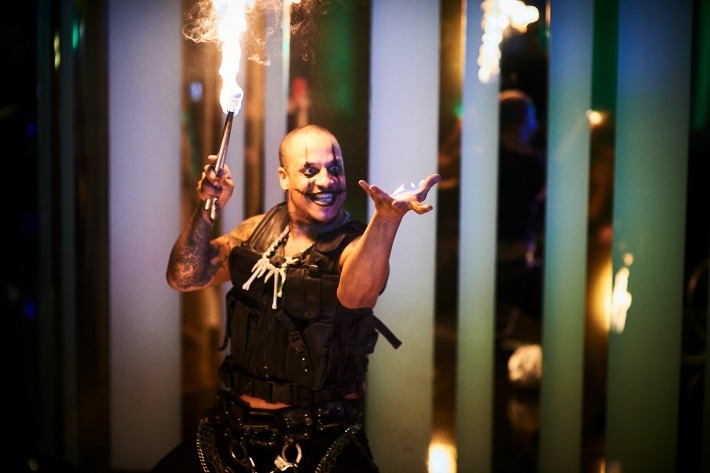 Throughout The Lounge and The Perception Bar guests were entertained by breath-taking acts featuring fire performers whilst exquisitely costumed mixologists served electric cocktails with, naturally, plenty of tequila and live DJ sets to create a truly exhilarating vibe. A beautifully decorated leather sofa, hand tattooed by local Frith Street Tattoo (what, you mean you don’t have a bespoke tattooed leather sofa? 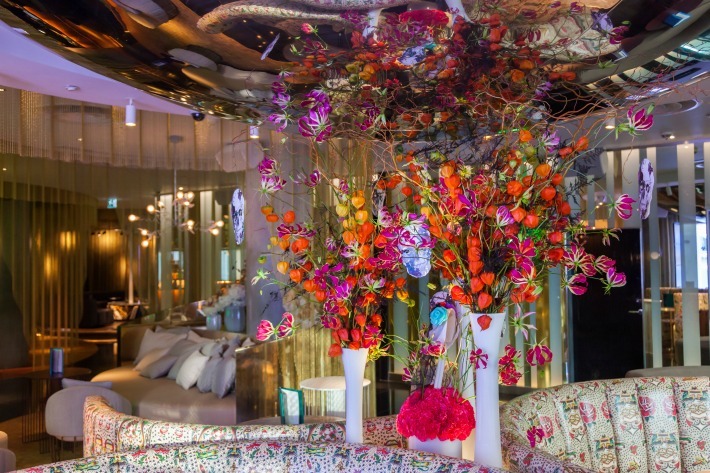 ), was pride of place amidst curved seating areas and centre stage: our piece de resistance of wild, colour-themed florals. We filled white vases with Chinese lanterns and gloriosa lilies, and black painted asparagus-fern was strung alongside black and white sketches of human skulls. 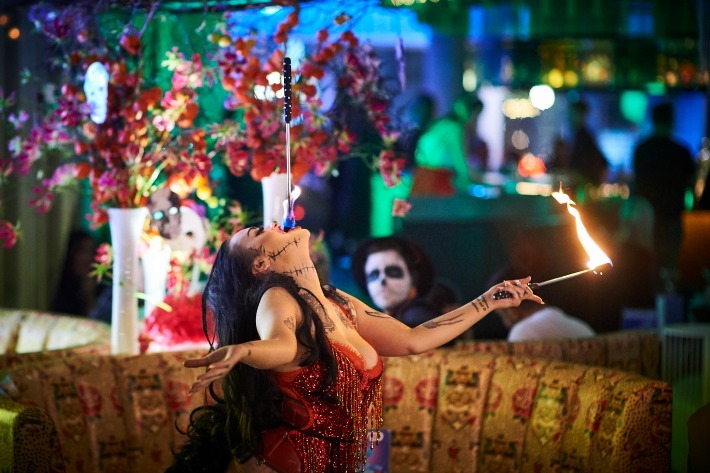 Elsewhere, token floral offerings were made to the spirits set on tables surrounded with jars of marigolds, callas, chillies and candle-light, vintage photographs and ceramic skulls. 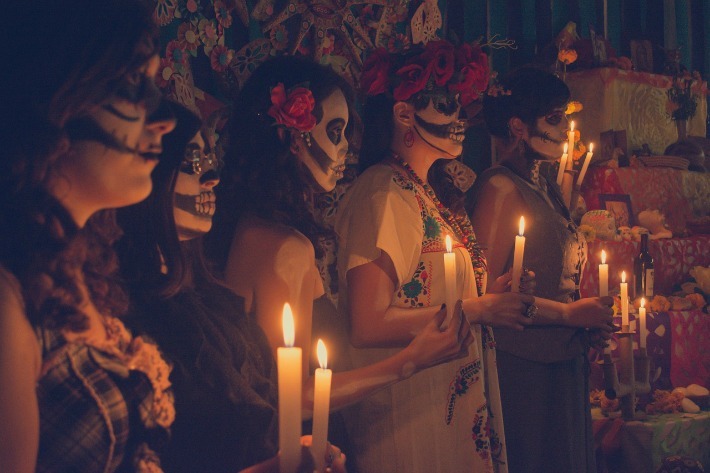 It was a very special party, and one, we hope, that did those departed souls re-visiting the land of the living on El Día De Los Muertos proud. 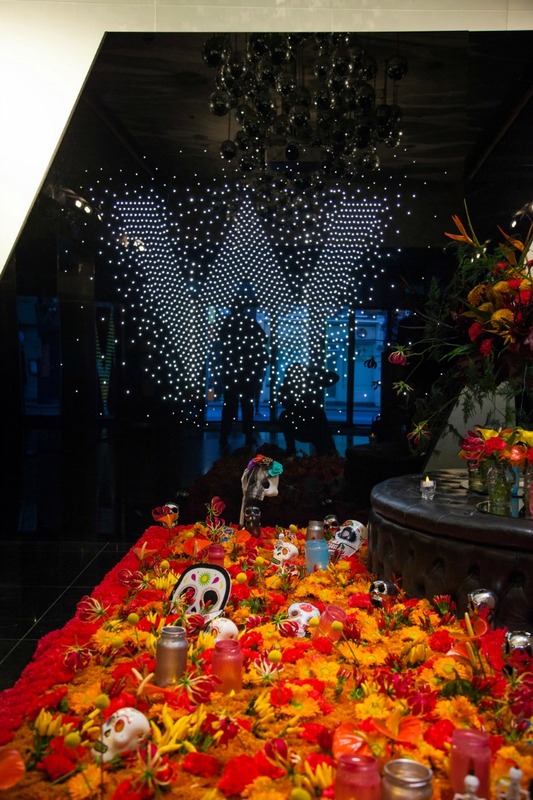 If you want to experience the wonders of the 2018 Day of the Dead festival for yourself, the V&A are holding their own free event on 2nd of November with live music, dancing and puppets plus an ‘ofrenda’ dedicated to Frida Kahlo. Alternatively check out Disney’s animation Coco inspired by the Day of the Dead holiday, this movie is full of joy colour and of course marigolds! 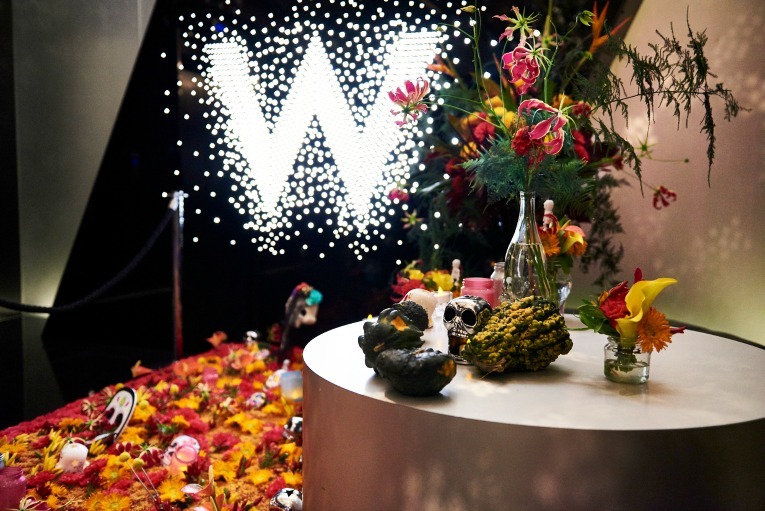 With thanks to W London Hotel for party images and Andrea Dutton for installation images.